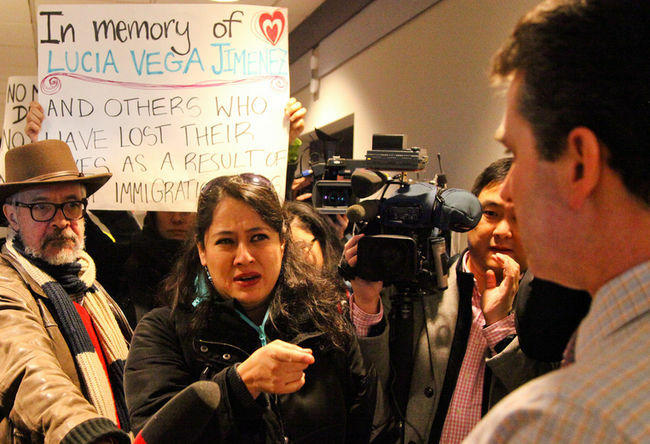 Several dozen people crammed into the foyer outside Canada Border Services Agency’s Vancouver offices Wednesday, delivering a petition demanding a public inquiry into a Mexican woman’s in-custody death. The BC Coroners Service is continuing to investigate the death of Lucia Vega Jimenez, a failed refugee claimant who was awaiting deportation after being arrested for an unpaid transit fare in early December. She was found hanging in her cell on Dec. 20 and died eight days later. The BC Civil Liberties Association, Pivot Legal Society and No One Is Illegal are calling for a public inquiry and increased oversight over CBSA’s operations. Their petition garnered more than 7,500 signatures. Advocates also raised concerns over CBSA contracting out of guarding detainees to Genesis Security, a private security firm. Coroners service spokeswoman Barb McLintock explained that only once all evidence is reviewed by the chief coroner will she determine whether to call a public inquest, in which the jury is restricted to making recommendations. “In more cases than not, when someone dies a non-natural death in custody, the chief coroner decides a public inquest would be the way to go — but not always if she concludes, on getting the report from the investigating coroner, that this would be in the public interest to have all the evidence aired publicly … to have a jury make recommendations on preventing future deaths,” McLintock said. CBSA’s regional director Roslyn MacVicar declined an interview request, but last week issued a statement defending the agency’s detention practices as respecting Canadian law and international standards.